Gov. Paul LePage speaks to members of the community during a drug summit at Crosspoint Church in Bangor. The Omnibus Energy Bill of 2013 was the most sweeping single piece of energy legislation so far in Gov. 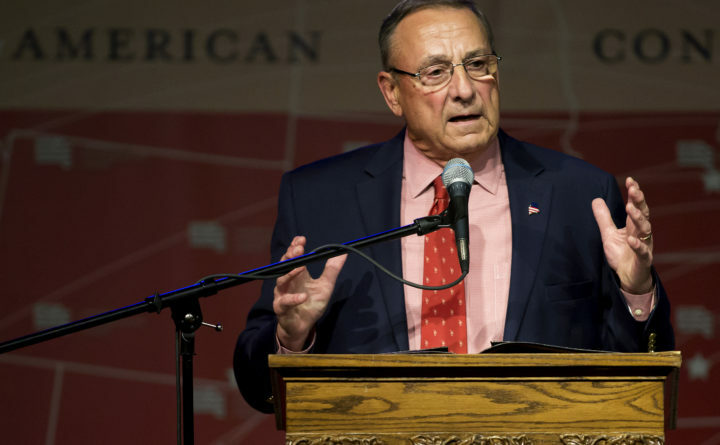 Paul LePage’s tenure, but lawmakers have passed a range of other bills to change the course of Maine’s energy policy in that time. Much of the time, however, has been defined by actions not taken and deferred decisions on matters such as how to compensate small electric generators, how to let new technologies compete with utility proposals for new power lines and in what circumstances, if any, a utility’s sister company can control electric generation within their service territory. The following is a summary of some major pieces of energy legislation, from the 125th to 128th legislatures, that became public laws. —Deregulate landline phone service while setting up a system to ensure mandatory basic service statewide ( PL623). —Three separate bills tweaked the objectives of the Maine Public Utilities Commission ( PL109), the Governor’s Energy Office ( PL55) and the Office of the Public Advocate ( PL79) to include advocating for lower prices. —Natural gas expansion projects can qualify for certain bond financing through the Finance Authority of Maine ( PL261), on an emergency basis. —Regulators can make changes to net energy billing, or net metering, through their routine technical rulemaking process ( PL262), which fueled deep controversy in 2016 and 2017. —Maine will withdraw from a regional cap-and-trade program if other states do ( PL277). —Omnibus Energy Bill ( PL369): enabled regulators to commit ratepayer money to natural gas expansion projects; restructured the Efficiency Maine Trust; reopened term sheet negotiations for offshore wind pilot projects, particularly for a UMaine-led project. —Allow the struggling Great Northern Paper to negotiate a deal to cash out on its discount power agreement with hydropower generator Brookfield ( Private and Special Law 27). —Wind farms must use “best practical mitigation” measures and must prove construction on ridgelines above 2,700 feet doesn’t interfere with Bicknell’s Thrush habitat ( PL325). —Require utilities to create a special program for low-income customers who get behind on their bills, giving them “an affordable payment plan” ( PL556). —State regulators and economic development officials should encourage solar power growth and manufacturing in Maine and study the value of solar power, for a report due in early 2015 ( PL562). —Add an “and” to the omnibus energy bill, adding roughly $36 million a year to the maximum potential funding for the Efficiency Maine Trust ( PL255). —Use surplus tax dollars to fund up to $13.4 million in subsidies for up to 80 megawatts per month of biomass electricity generation ( PL483). —Remove language stating that nuclear power caused “severe financial strain on consumers” in the recent past ( PL185). —Establish a fund for municipal broadband grants, giving the program $500 a year ( PL323). —Allow regulators to have electric customers pay for natural gas storage if they don’t do so for natural gas pipeline capacity per the Omnibus bill ( PL445). —Allow utilities to run programs to finance the purchase of electric heat pumps ( PL446). —Remove a requirement that FairPoint Communications provide rate-controlled basic landline service in certain parts of the state ( PL462). —Redirect funds from a regional cap-and-trade program back to “energy-intensive manufacturers” ( PL498). —Extend the deadline to 2020 for regulators to have electricity customers pay for natural gas pipeline capacity ( PL22). —Place new restrictions on residential competitive electricity providers to protect customers ( PL74). —Allow broadband service providers joint-use access to utility poles ( PL199). —Allow companies affiliated with investor-owned utilities to own and operate power generation outside of its service territory ( PL287). —Keep the state’s renewable energy purchasing requirements at 10 percent of electricity sales until 2022 ( PL291). Stay informed with BDN news updates in your inbox. Sign up here.